My dearest Grandpa just celebrated his 80th Birthday!! YEAH GRANDPA!!!! We are counting our blessings because he was the one that just suffered from a heart attack recently. I had meant to make him a Birthday card and low-and-behold Emma with My Creative Time is doing a Throwback Thursday Birthday challenge. She challenged crafters to use the Celebration cartridge. Unfortunately this is not a cart I own. If you don't own the cart Emma challenges you to use an older cart. One of my older ones is Wild Card (one of my favs!!!) I used the Wild Card cart for the shape of the card. The number 80 was used from the Plantin Schoolbook cart and the cake in the background was from Disney Princess - Dreams Come True. I know it has a ribbon, but I don't like the top of the card (where it folds) so I figured a brown ribbon should be OK even for a guys card, right? To my Dear Grandpa - I love you and I'm glad you're around to celebrate you 80th Birthday!!!!!! You mean the world to me; and no matter what all of the other grandkids think (all 62 of us) - I know I'm still the favorite (even if it's just because I was the first grandchild)!!!!!!! LOVE ALWAYS!!! I used the My World Classmate cart and my Gypsy to make it fit the A2 card. The letters are from Plantin Schoolbook. Happy Birthday my dear brother!!!!!!!!!! We love you!!!!! Well, such is life . . . I can't be too upset, I thought it would happen eventually I just hoped I would have more time. It is hard for me to accept, and my boss had a hard time too. I have been her assistant for the last 5 plus years. We work AMAZINGLY together! She is one of my best friends!!! I wanted to give her a card to thank her for being such a great boss, but more importantly, my friend! She's one of those people that touches your heart and soul!! This card was made from some paper I got at a local paper/envelope store and scraps. The word 'friends' is from Gypsy Wanderings and the flower and dragonfly is from Home Decor. There is a super fun Blog Hop going on right now. It's starting at The Pink Cricut, you would be amazed with the creativity! You really should go check it out!!!! I posted a little while ago that I won something from Carol with Paper Arts! YEAH!! Well, I just got the flowers from her last night. My DH and I had a few things to get done, but I was able to get a cute little card made up. The hardest part was trying to figure out which flower to use first!!!!!! This card is for some of the ladies in my community (Relief Society Presidency). They've done a few things for me lately and I owe them big time!!! Thanks again Carol!!!!! I love the flowers!!! Don't worry, you know I'll put them to use!!!!! What do you think?! Wow! It must be my Birthday or something! I can't believe it!!! Today is my birthday (doing great so far). I woke up without my children in my bed (they usually find their way in the middle of the night); and felt very refreshed. We've been visiting family and decided to go for an ATV ride with everyone. What an AMAZING ride!!! We had a great time with beautiful weather on a wonderful trail. It was so much fun. After we got home I decided to check the blogs I follow (I love all of the creative people out there). Low and behold I found out that I won something!!!!! YEAH!!!!! I went through the Canada Day blog hop and came across so many talented people; especially The Cropping Canuck. To sum it up WOW!! What creative and beautiful work!!! I couldn't believe I won this super cute shirt, how adorable is it!!!! This is the thing. I LOVE decorating cakes. I'm not very good at it, but they're still edible, so I figure it doesn't really matter. My cute little nephew's birthday was a few days ago and he and his parents and siblings came to visit for his birthday. They had already celebrated with a cake at their house, but I don't think you can celebrate at my house without a cake too!!! I volunteered to make a cake for him. Right now he is into NASCAR. Since we live in the middle of nowhere - the chances of finding a NASCAR cake pan was very slim (we even drove 45 minutes to the nearest Wal-Mart)! After no luck finding a car shaped pan, I decided I was going to make a car for him out of two loaf pans (one was bigger than the other). I got a recipe from a neighbor for fondant and thought it was worth a try. Well, it wasn't my favorite, but it turned out cute. Next time I think I'll stick with just butter cream frosting - but it was fun to try!!! I love following in blog hops! 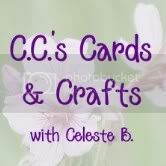 I recently followed one that took me to Paper Arts with the wonderful and talented Carole. I'm so excited!!! I just found out that I won her blog candy, I'm so excited!!! Thanks so much Carole!!!!! I can't wait!!! My Mom is in a position in our church where she needs a lot of cards. There's been several times when one card is not enough for people to sign. So I got thinking about what I could do to help, that's when the idea for this card came into play. For the card holder - I used the DS software to weld a rectangle to two tags, all from the George cartridge. I put a square with rounded edges for the window part. Of course I used Walk In My Garden for the butterfly, bee and lady bug. Paper Doll Dress Up was used for the grass. I used the DS software to change the width.